Pro Wash, LLC is the Nashville areas most experienced multi-family pressure washing company. We have completed full property cleanings at some of Middle Tennessee’s largest and most luxurious apartment and townhome communities. 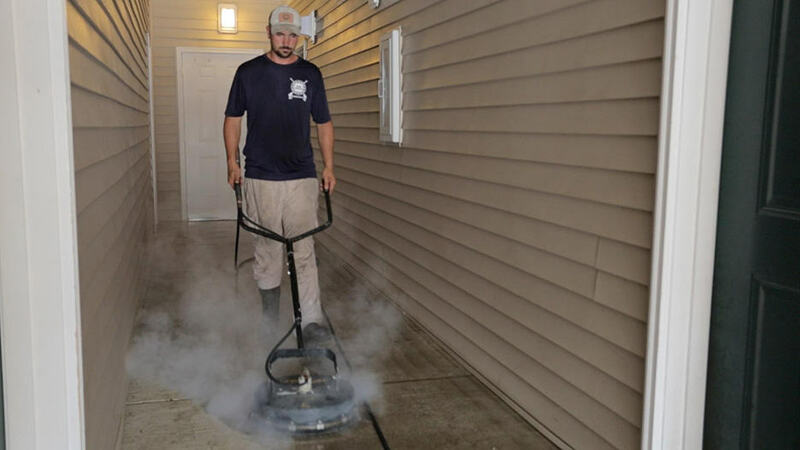 Our many years of experience performing power washing services in multi-family settings has allowed us to dial in our processes and overcome the many obstacles and issues commonly encountered when performing exterior cleaning in a community setting. Providing solutions to issues like these for years is what sets Pro Wash, LLC apart from the competition. Our soft wash process allows us to clean 3 story buildings from the ground! This is very beneficial to the property because of the minimal impact made. We can leave the building exteriors sparkling clean WITHOUT the inconvenience of noisy man lifts, dangerous ladders and unsightly scaffolding. Our exclusive low pressure cleaning process is also much safer than traditional high pressure cleaning. Click here to learn more about how our low pressure cleaning process works. We take breezeway cleaning far beyond the typical “just pressure wash it” mentality. First of all, the equipment we use is far superior than anything that can be purchased at big box stores. Second, the methods, chemicals and attachments are purpose built for the professional cleaning contractor. We begin by spot-treating heavily soiled areas with eco friendly detergents, followed by a mild detergent application to all concrete surfaces. This helps to break down any contaminants and stains even further. Next, we use rotary surface cleaners to pressure wash all of the flat concrete surfaces of the breezeway. The water being used is heated to around 180 degrees, which removes up to 50% more staining than pressure washing with cold water. Depending on the application, breezeway walls and ceilings are cleaned using the same low pressure cleaning method as we would use on the exterior of the buildings. Precautions are taken to reduce the chances of water intrusion under doors and around fire alarm components. Proper signage is always placed at the entrances to breezeways so that residents are aware of the project at hand. Interested in our services? Call today to schedule a free demonstration of our pressure washing process. Our experienced team will explain our processes step by step and show you the results before you sign up for the service. We have an extensive list of references from Nashville area apartment complexes and HOA communities. We offer FREE notification letter posting so that property personnel can rest assured that every unit has been notified of the upcoming cleaning project. This also gives us the opportunity to inspect each building or breezeway and make notes of any issues prior to the cleaning taking place. Request A Risk Free Assessment!